Being responsible for all business logic and other sensitive operations under the hood, the backend of your app is truly the most essential part of your product. There are many factors that define the quality of an app, such as its ability to perform well and scale smoothly as well as the maintainability of code and overall system security. All of this depends directly on the quality of the web application’s backend. That’s why it’s important to choose the right tool for your project. When it comes to choosing a tech stack for backend development, you have a plethora of options: Ruby, Node.js, Go, Python, PHP, etc. Within this diversity, making a decision without knowing essential facts about each of these technologies can be burdensome. We’re here to help you with this decision. Сheck out how we tackle the most common backend challenges! In 2018, JetBrains named Go the most promising language. Uber, UpGuard, and Koding have migrated from Node.js to Go, and Basecamp, which developed the Ruby on Rails framework, is actively using Go for their backend services. Let’s find out which of these two tools is best for your project. In 2014, an independent fork of Node.js, called io.js, was created. A year after, the io.js and Node.js communities started working together under the newly established Node.js Foundation. You can use Node.js in several ways. 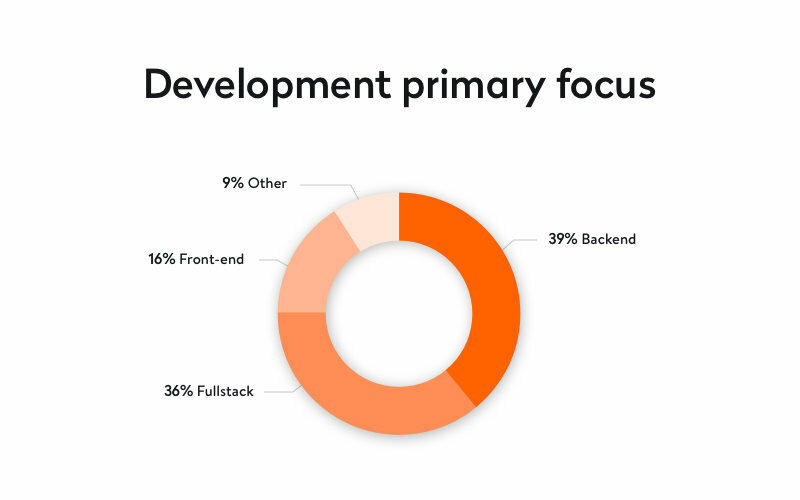 According to a 2017 survey by the Node.js Foundation, 39% of companies that use Node.js primarily apply it to backend and full-stack development. It’s less commonly used for frontend development and creating desktop applications. Go, also called Golang, is an open source, statically typed, compiled, cross-platform, and lightning fast programming language first introduced by Google in 2009. Go is multi-purpose, it is a good language for backend development. Google developers wanted to mix the good sides of existing languages while solving their most common problems. Just like C++ and Java, Go is a statically typed language with high-level efficiency. Go is also similar to C in terms of speed and syntax. It’s a clear and simple language that allows developers to write readable and maintainable code. Read also: Why use the Go language for your project? The first stable version of Go appeared in 2011, providing developers with robust goroutines, a garbage collector, and an embedded testing environment. Slowly but steadily, Go has been conquering the developer community. According to the Tiobe Index, Go was the Programming Language of the Year in 2009 and 2016. In 2019, Go climbed to 16th position in the Tiobe Index and seems poised to continue gaining in popularity. The PYPL Index also testifies to Go’s popularity, putting this language in 17th place. In the Stack Overflow development survey 2018, Go is the 16th most popular programming language. 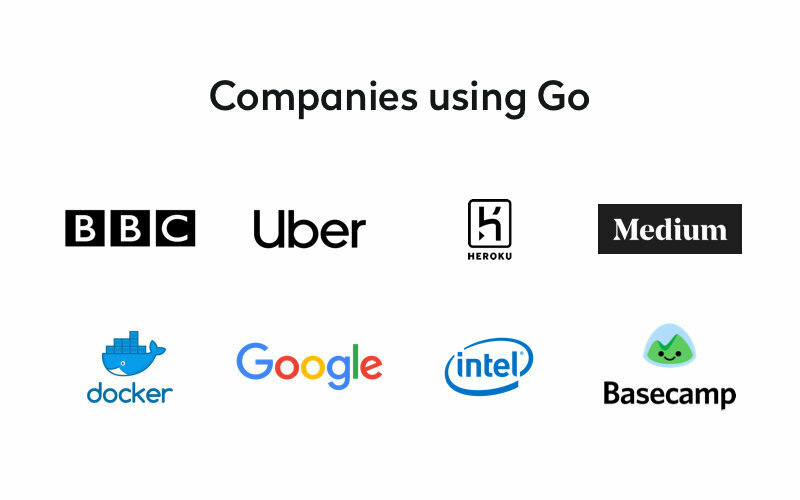 Web apps using Go include Uber, BBC, SoundCloud, and Basecamp. 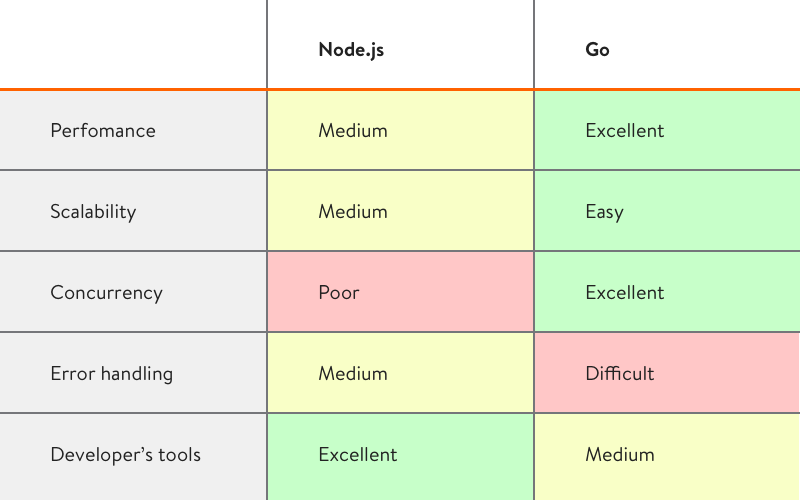 Now that we’ve given basic information about Node.js and Go, let’s compare them in terms of scalability, performance, error handling, and other criteria. So who will win in the Go versus Node.js battle? Performance greatly affects an app’s load and response times. Hence, it directly affects customer satisfaction with your app. Most developers point out that Go shows the same performance as C and C++, which is really good. Go has no virtual machine and compiles to machine code, so programs are executed fast without warm-up time. Also, Go has a built-in garbage collector that monitors and identifies occupied memory that’s no longer needed and frees it for reuse. This lowers the risk of security vulnerabilities due to code encapsulation and provides effective memory management. 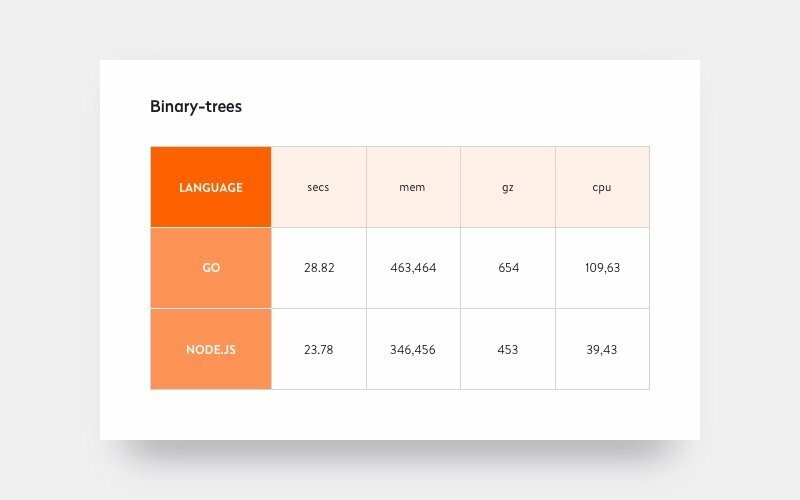 Go is an ideal solution for building microservices due to the tiny memory footprint and fast performance of Go apps as well as the convenience of statically linked binaries. Node.js code is reusable. This is crucial for event-based applications that update data in real time, and it’s widely used for instant messaging, video chats, and online gaming. In 2013, PayPal switched from Java to Node.js and shared its experience using Node.js. They said that after migrating to Node.js, their pages were served 200ms faster and the average response time decreased by 35%. In terms of raw performance, Go is the indisputable leader. But in real life, Node.js and Go show equally good performance. To compare the differences in performance of these two languages, you can also check out synthetic tests by The Computer Language Benchmarks Game. Concurrency is the ability of a program to organize its execution into several separate flows and communicate between them. Concurrent programming techniques are a good way to use the CPU efficiently and increase app performance. Concurrency is an essential factor for enterprise-scale apps or apps that need to handle thousands of requests simultaneously. The more concurrent an app is, the less chance the app will crash under high load. Rob Pike, the creator of Go, says that Go is an excellent tool for large software projects. With channels and goroutines, concurrency is a strong side of Go. Goroutines are methods or functions that run in parallel with other methods or functions. Goroutines are lightweight: their initial size is only 4 KB, compared to operating system threads, which are initially 1 MB. The Go environment allows developers to run thousands of goroutines simultaneously without using too much RAM. Information between two Goroutines is passed via channels that hide the complexity and let you structure your programs in a maintainable way. Since Node.js is single-threaded, sometimes CPU-bound tasks block the event loop and slow down your program. As a result, you get a slow app and annoyed users. Both Node.js and Go are open source, meaning whole communities are engaged in improving these languages, fixing bugs, and creating new proposals. And both Node.js and Golang have repositories on GitHub. A large community also means a lot of developers, making it easier to find the right specialist. Node.js is a mature tool with a large and vibrant open source community. The Node.js Foundation is geared toward enabling widespread adoption of Node.js. In its first year, this foundation formed a team of professionals responsible for security and created a long-term support plan for improved stability. For now, the Technical Steering Committee consists of 18 members, while the number of contributors exceeds 2000. GoDaddy, Intel, IBM, Microsoft, PayPal, and NodeSource are active members of the Node.js Foundation. Each year, the community organizes Node+JS Interactive, an event at which developers announce new improvements and changes to Node.js. To date, Node.js has reached one billion downloads and 56,000 stars on GitHub. The Go community is much smaller but keeps growing every year. Google’s support is a quite weighty reason for migrating to Go. GopherCon, which is held annually, gathers Go developers from all over the world to discuss new opportunities and changes. This conference had led to an increasing number of developers interested in contributing to the Go community and projects. According to a Golang survey in 2017, 59% of respondents wanted to contribute to the Go community, up from 55% the year before. Ready-made solutions facilitate development and cut costs for web app development. A large variety of development tools and frameworks is another reason to choose Node.js. Node.js is an event-based framework with a microservices architecture. A microservices architecture means that one application is divided into smaller modules with well-defined operational interfaces so you can easily add new components to your app. Npm, which stands for Node.js package manager, is one of the best things about Node.js. It consists of approximately 800,000 ready-made ‘building blocks’ (tools for any particular case) that can be installed and run without any hassle. But choose these wisely – although the core technology is really good, npm lacks a well-structured list of blocks, and sometimes it may take time to find the right block. Go has a smaller number of tools compared to Node.js. This can be explained by the fact that Go has a standard full-fledged library with features that don’t need third-party support. But on the other hand, Go has no built-in GUI library. Even though the number of Node.js tools far exceeds the number of Go tools, Go does have such robust tools such as Gofmit, Godoc, GoMetaLiner, and Go run. Node.js uses the traditional try...catch error technique, where errors are caught immediately when they occur. Unlike NodeJS, Go separates run-time and compilation-time errors, which are supposed to be handled differently. This raises difficulties for developers, however. But the creators of Go have been doing their utmost for language evolution. In August 2018, Go developers announced that they had started working on Go 2. The next version is expected to finally get additional support for error handling, read-only values, and some form of generics. It shortens developer’s time for debugging since it helps to find errors faster. What do major tech players say about Go and Node.js? Now let’s see what popular companies say about using Go and Node.js for software development. In 2016, Uber migrated from Node.js to Go to improve the performance of their geofence lookup microservice. This microservice turned out to be the company’s service with the most queries per second (QPS). There were several reasons why Uber decided to migrate to Go. First, the dynamically typed and interpreted nature of Node.js hinders the ability to handle CPU-intensive point-in-polygon algorithms efficiently. Second, to ensure that they had the freshest geofence information, Uber needed to refresh information from several sources simultaneously. This took a lot of time with Node.js, since it’s single-threaded. Goroutines allowed the Uber app to perform several tasks simultaneously. Uber developers have shared their experience using Go, saying that Go is extremely easy to learn and maintain, they also highlighted Go reliability: Uber has experienced 99.99% uptime with Go. They also have highlighted that the language has high performance in terms of throughput and latency. The Uber app can handle a peak load of 170,000 queries per second. Basecamp has also highlighted Go’s simplicity. Noah Lorang, a data analyst at Basecamp, says that Go is a great solution for building data pipelines thanks to its goroutines. In his mind, Go’s main pros are its robust standard library, simple syntax, and easy process of refactoring and deploying. The whole user interface of the Netflix app is built with Node.js. The Netflix development team chose Node.js because they wanted a fast and lightweight application. By moving to Node.js, they achieved a 70% reduction in app startup time. As you can see, it’s quite hard to say for sure whether Node.js or Golang is better. It greatly depends on the type and characteristics of the app you want to create. 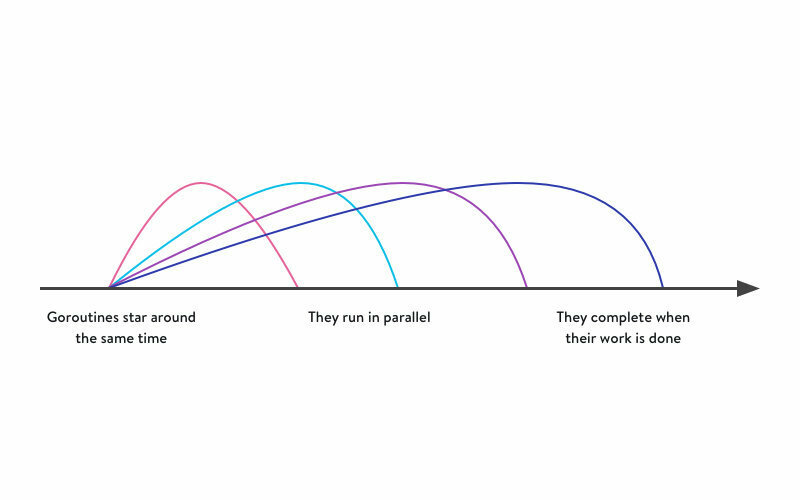 Each task requires the right tool, and Go and Node.js are good at different things. While Go is perfect for microservices and enterprise-scale projects that need to handle high loads, Node.js has a great variety of ready-made solutions for almost every development challenge so you can dramatically reduce custom software development time. Can’t decide which tool to choose? Drop us a line and we’ll help you to make the right decision depending on your project. Have a web app in mind?